Digital thermometer with auto saving log file in excel by Pic microcontroller is vary advance, useful and realistic project. The implementation filed of this project is wide. Now a day’s atmospheric prediction saves lots of life. And for getting wright prediction we have to analysis lots of recorded data. By using this project it can be easily serve the purpose. To know the project description you should know that how it works? 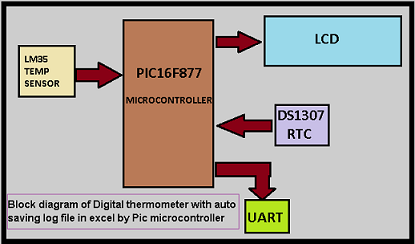 In this project “Digital thermometer with auto saving log file in excel by Pic microcontroller “we use LM34 IC as a temperature sensor which sense the atmospheric temperature and send the analog value of it. Now we know microcontroller can only process digital value so we convert the analog value which sends by LM34, by inbuilt ADC unit of PIC16f877. After converting the reference temperature value microcontroller process it with some mathematical formula to convert the reference value in Centigrade scale. We interface DS1307 IC for getting the time and calendar in real time mode. 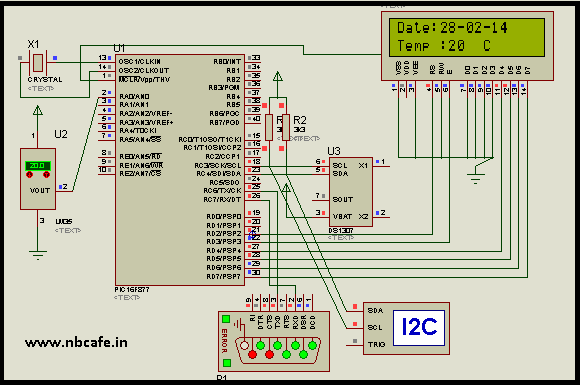 To know the details step by step tutorial on “how to interface DS1307 with PIC16f877 microcontroller?” you may follow my old post Interfacing DS1307 Real time clock with PIC16f877. Now big question is how to create log file in excel and save it to PC? For now that you have to see the bellow video where you find the step by step process on how using windows HyperTerminal software, we can receive data via comport (serial communication) and capture the data in CSV format. So for saving the data in CSV format we have to send comma separated data with exact format via UART from PIC16F877 microcontroller. It is a major thing we have to do for sending data in CSV format. As we know the name CSV means comma separated values so we have to send every data separated by comma. And as per Excel for changing column we have to press Tab Key and for change Row we have to press Enter Key. To make our format accordingly our plan we have to send data followd by comma and others key. In this project, we save the data at three column for temperature, time and date see in fig. For that we use code (In Mikroc for Pic) given bellow.